It’s been much too long since I have updated my blog, and I thought that getting back into it with a “winning” story would do the trick! Annd, cue the drum’s “ba-dum-tsh” for my poor pun. I wish I could say that I spent this summer lounging about the patio, sipping lemonade, in between family actives and horseback riding. Alas, work and grad school did get in the way of that ideal dream. But somehow I still managed to have time for knitting. 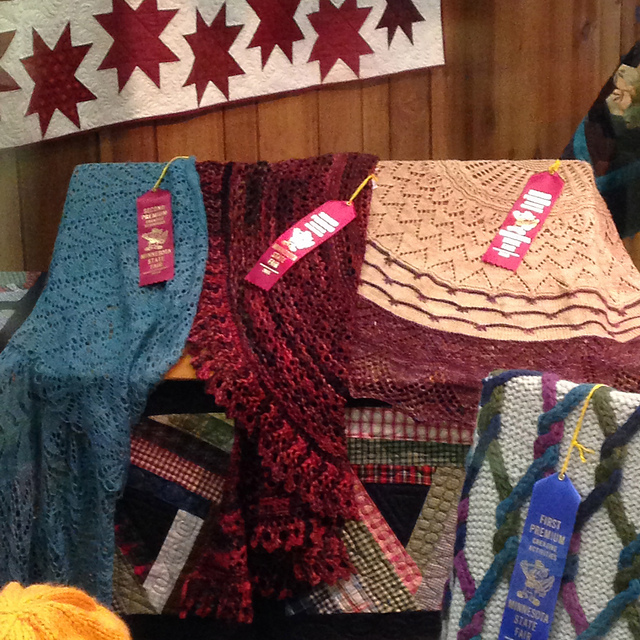 I entered 8 projects at the state fair this year! I didn’t get a full run of 1st – 5th place ribbons like last year, but I scored awfully close to placing on most. And, I did get 3 ribbons total! My highest-placed project this year was my Monsoon Shawl. I first blogged about this in my series of posts about Malabrigo March – I started and finished this shawl during the month of March! There it is! Right in the middle (with the wrong side showing…). 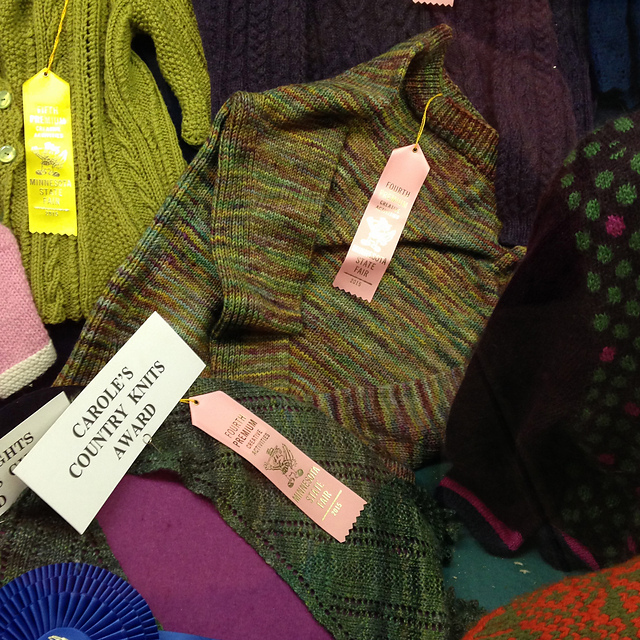 The next project that did well was my Crosshatch Pullover, also knit within one month and also with Malabrigo Rios. This was a test knit, and I also knit it during Malabrigo Stockpile in the Malabrigo Junkies Ravelry group. It was also the first sweater I knit using Malabrigo! You can actually see my sweater pretty well in the sweater pile! Haha. And like the shawl, it looks much better when worn! 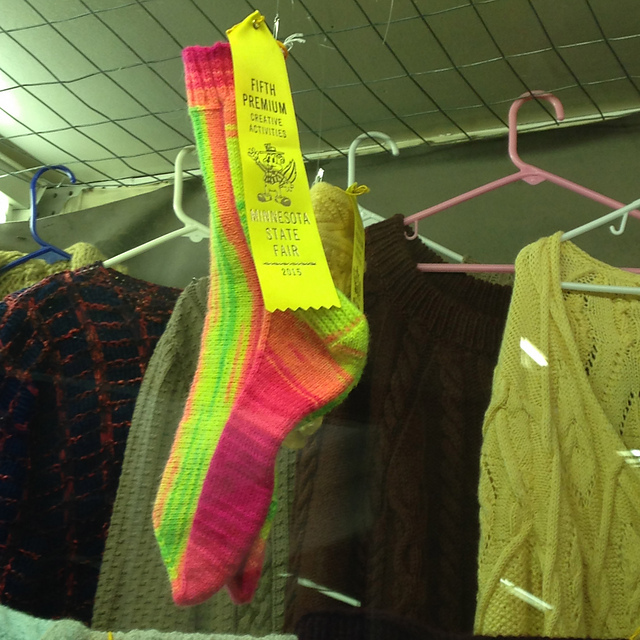 Last but not least, I received a 5th place on my Vertizontal socks. This was one of my favorite projects to knit, as it drew a lot of attention from other knitters in my knitting group and when I knit in public (I really did get a lot of comments – even non-knitters asked what I was making!). I bought the yarn in April and was waiting for the perfect pattern for it. Although I was predicting a higher placing than 5th (I got 1st in this category last year), I am happy with how I did since there were a few secret, teeny tiny mistakes. 🙄 Oops! The last 5 projects I entered were all pretty close, as I mentioned. My Whakamārie Top was a test knit I did this summer, and received a score of 94 in the “Sleeveless Sweater or Vest” class. That means I was ONE POINT away from placing 5th! There were 10 entries. 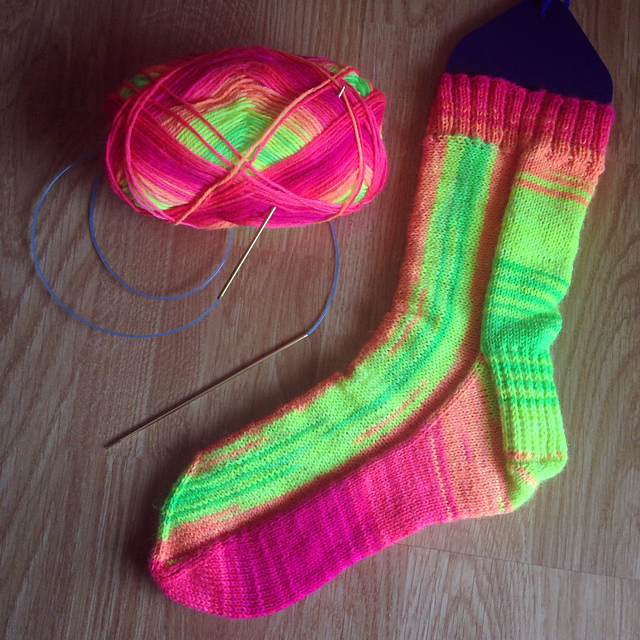 I used Malabrigo Rios on this one too…surprise, surprise! I think I see a trend! Another project that I scored a 94 on was my Happy Hat. I whipped this up as part of Malabrigo March, in just one day! 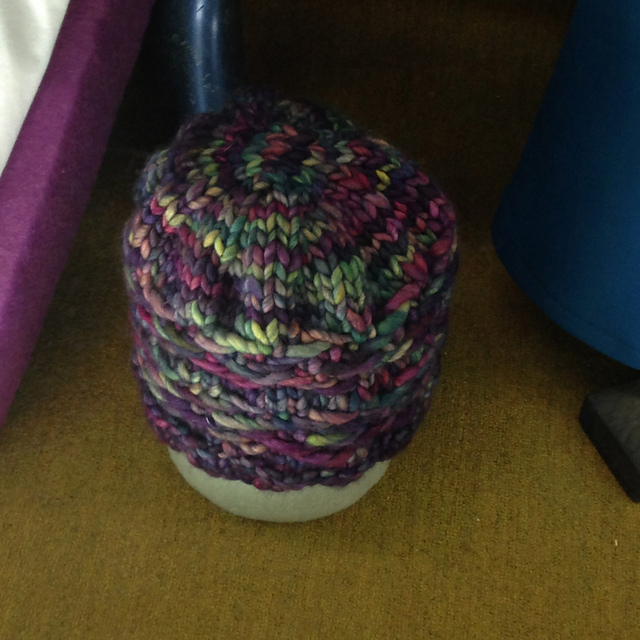 I didn’t think I would do well, since the “Textured Hat” class is very tough and always full of beautiful, intricately cabled hats. However, a score of 94 also means here that I was ONE POINT away (again) from placing! I was pretty excited about this for a last minute project I decided to enter. 🙂 There were 27 entries! Hee hee, this is how it was displayed – at the bottom of a case, on a bucket-type thingy. The next project scored a 93, which I was also ecstatic about. This project was in the “Lightweight-Yarn” Shawl class, and is one of the hardest classes in my opinion. This score meant I was at 6th or 7th place – and there were 42 entries! The judges only judge the top 25 if there are that many projects, so it was great to even have a comment card on this one. This project also deserves its own blog post…someday that will happen! For now, you can check out my Romantic TML project on Ravelry here. Coming in slightly lower, my Blanca Cable sweater was another test knit. It scored 93, and was in a class of 15 sweaters. This one DID get its own blog post (check it out here), and I wasn’t sure what to expect in the “Adult Texture Pullover” class for my first time. After looking at the winners in this class, I realized I need to step up my cabling game. They had cables going ALL OVER the place and in some crazy directions! Check out my Yuki Onna Socks on Ravelry here! Overall, I was coming from high expectations with all of the ribbons I won last year. But, after seeing the tough competition and extremely beautiful projects that I was up against, I am very happy with how I did. Ooooohhh yeahh, a double cheese burger. And Pepsi. 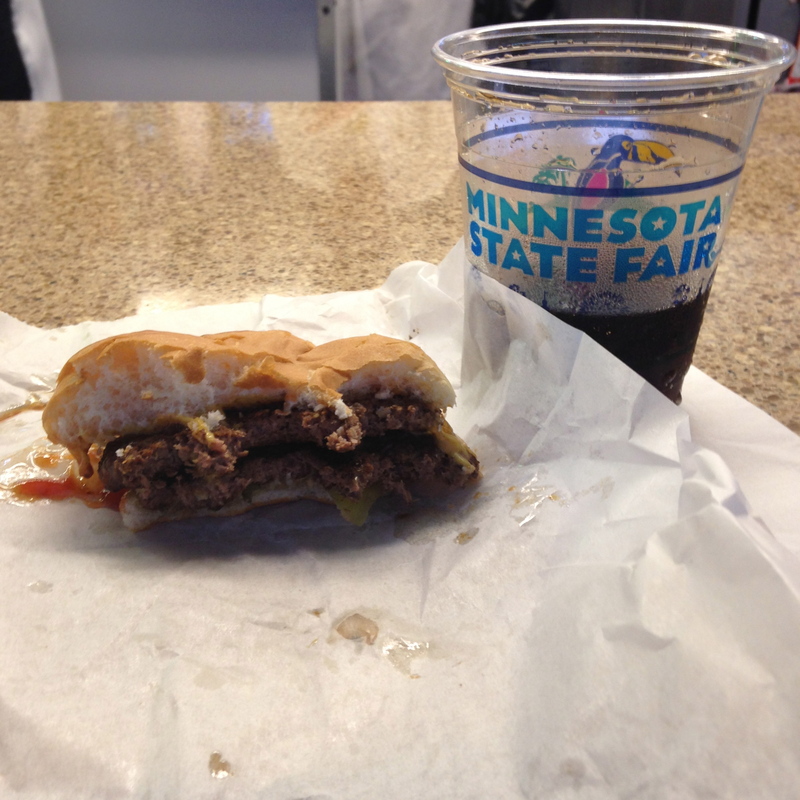 I was at the fair this year for 5 WHOLE DAYS, out of the entire 12, so I had my fill of fair food! Congrats on all your ribbons. Your projects look great even if you didn’t get all the scores you’d hoped for.